At about the time our human ancestors started wearing clothes, something amazing was happening in a nearby dwarf galaxy. There, a star about 18 times more massive than our own Sun, was reaching its catastrophic, yet beautiful, end. This star, named Sanduleak -69° 202, was a blue supergiant located on the outskirts of the Tarantula Nebula in the Large Magellanic Cloud. As is the case with these types of stars, it had the mass to not only fuse hydrogen and helium, like our own Sun, but heavier elements as well. The star would have began fusing those lighter elements, but then progressing through the periodic table until the star had produced a core of iron and nickel. Up until that point, the energy output of the fusion process would have generated enough outward pressure to keep the star’s mass from caving in on itself. However, once a star begins fusing nickel and iron, there is no net energy output. When this equilibrium is broken, the mass of the outer layers of the star begins compacting onto its core. As the mass continues to, well… amass, there’s a point in which the star can no longer be stable. This is known as the Chandrasekhar limit. When Sanduleak -69° 202 exceeded the Chandrasekhar limit, a cataclysmic implosion occurred over the course of mere seconds. The outer core, no longer supported by the now-imploded inner core, collapsed. This sudden compression generated temperatures of up to 100 billion kelvin. The resulting physics produced an unimaginable shockwave which had enough force to accelerate the overlying stellar material into an escape velocity. The mass was sent away from what’s left of the star’s core and left behind an expanding cloud of stellar debris and a neutron star (stars with an even higher initial mass can collapse into a black hole). One thing to note here: while the existence of a neutron star is expected as a result of this supernova, searches thus far have been unsuccessful. Check out this link to learn more about the missing neutron star. About 170,000 years later, the light from that supernova finally reached Earth where it was observable with the naked eye in the southern hemisphere. It was first discovered by Ian Shelton and Oscar Duhalde at the Las Campanas Observatory in Chile, on February 24, 1987 (here’s the telegram that announced the discovery). 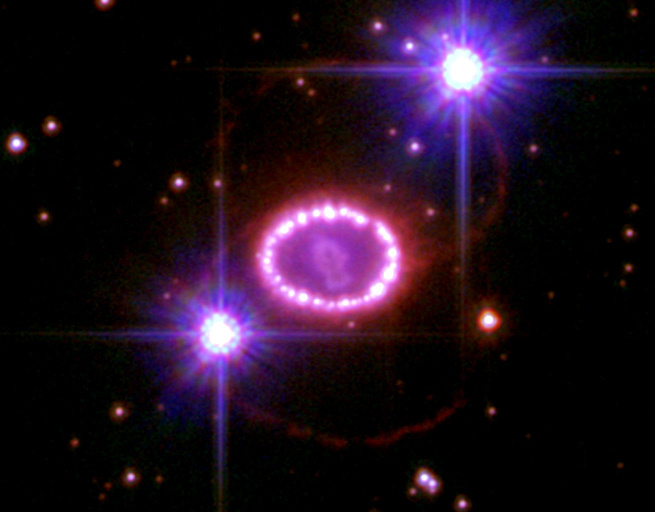 Supernovae are named by using the following convention: “SN ” followed by 4-digit year of its discovery, and ending with alpha-sequence indicating the order in which that year’s supernovae were discovered. 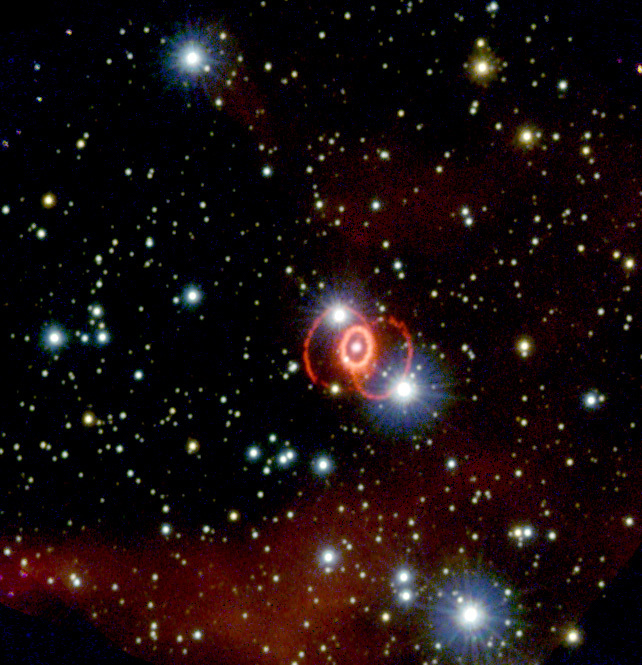 Thus, this being the first supernova discovered in 1987 was given the designation: SN 1987A. 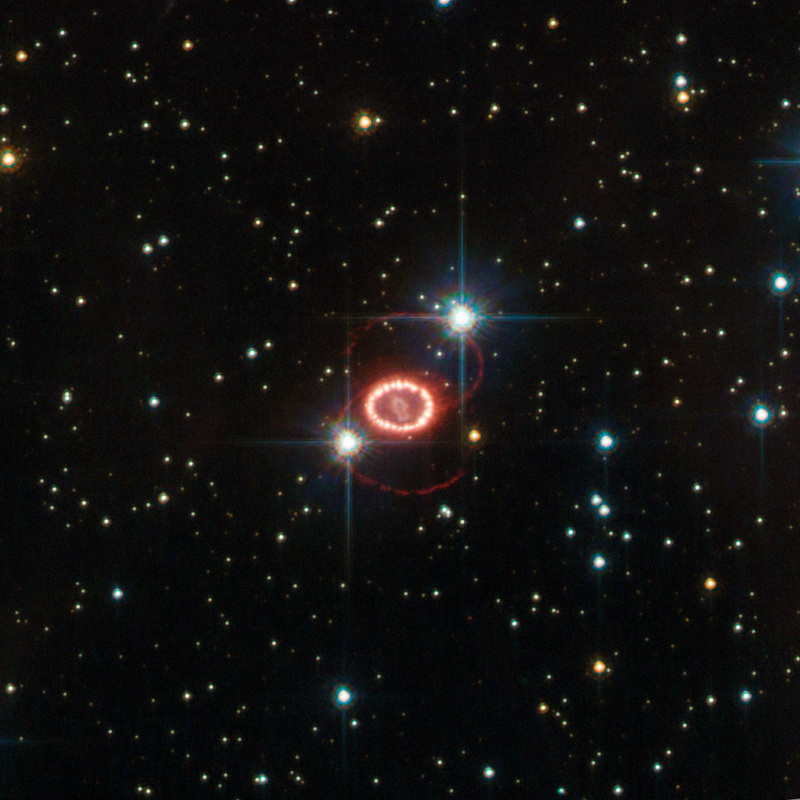 Today SN 1987A is still there. Actually, I need to be a little more nuanced with this part. When we look at distant objects in space, we’re actually looking into the past. We’re seeing them as they existed however long ago it took the light to get from there to us. SN 1987A is about 170,000 light years from us, which explains why something that happened during the lives of some of our most distant ancestors was only seen by us in 1987. So we don’t know what exactly is going on in the vicinity of SN 1987A today (though physicists could provide with some great theories), we can image exactly what it looked like 170,000 years ago. Supernovae are a common occurrence in our universe, if only because of its vast size. In a galaxy such as the size of the Milky Way, you can expect an average of two per century. However, these supernovae are so bright we’re able to identify many of them each year from around the observable universe. When stars explode, the brightness often surpasses that of the entire galaxy from within it occurred. Play the video below for an artist’s depiction of a collection of distant galaxies. Watch for the occasional supernova to get an idea of just how bright these can appear. One could only hope to have as beautiful of a death. Tagged death of a star, Hubble, Ian Shelton, neutron star, Oscar Duhalde, SN 1987A, supernova.